It’s the holiday season! That means you’re incredibly busy running around getting your last minute shopping done, attending parties, and who knows what else. We understand that the struggle is real. Therefore, for our December recipe for Phoenix Public Market we wanted to do something fairly quick to prepare and easy! 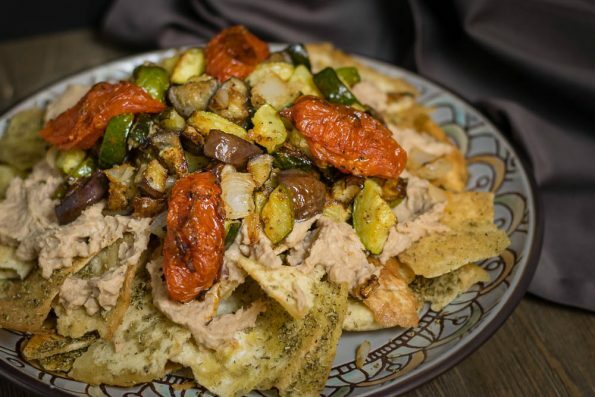 Our recipe for Roasted Veggie and Hummus Vegan Nachos are just that, quick, easy, and above all, delicious! While wandering around Phoenix Public Market looking for inspiration, we were struck by these gorgeous mini eggplants. We aren’t typically fans of eggplant, but these called to us. What could we do with them? We walked past the Doctor Hummus booth and it hit us. We would do nachos of some sort. In these recipes, we will generally use a majority of ingredients found at the market. We prefer nacho style cheese for nachos, so that was out. Then it became clear, hummus! This combination of pita chips, hummus, and eggplant for our Roasted Veggie and Hummus Vegan Nachos needed something. We chose to use the Rosemary Pita Chips to add a bit more seasoning. To round out the veggies, we added zucchini, tomato, and shallots. All of these wonderful ingredients combined created our fantastic Roasted Veggie Hummus Vegan Nachos! We hope you all enjoyed this recipe as much as we enjoyed creating it! 2017 will bring a ton of great new things to our site and this segment is no different! We’ll be kicking off next year with a slow cooker chili recipe, so stay tuned! Until next time! Happy Shopping! Pull hummus out of the refrigerator to warm up a bit. Scatter chopped veggies on baking sheet. Toss vegetables with oil, garlic seasoning, salt, and pepper. Cook for 30 minutes, turning halfway through. Cook for 10 more minutes, checking to make sure the vegetables don't burn. Arrange pita chips on plate. Top with hummus, followed by roasted veggies. That looks so delicious! And so easy to make! This is a great recipe for the days I’m working from home and I need something quick, healthy, and for one! I love nachos and I love them even more with some healthy, seasonal ingredients! These look amazing! You had me at nachos! I have been wanting to try vegan nachos and so this I will try in the next couple of days. I love the idea of using hummus for nachos! Great non-dairy idea. I like something that can be made quick and thats healthy too. This will be a great addition to my work lunch menu. What a fun take on nachos! This looks delish, I love anything with tons of veggies! Mmmmmm. Do you deliver. 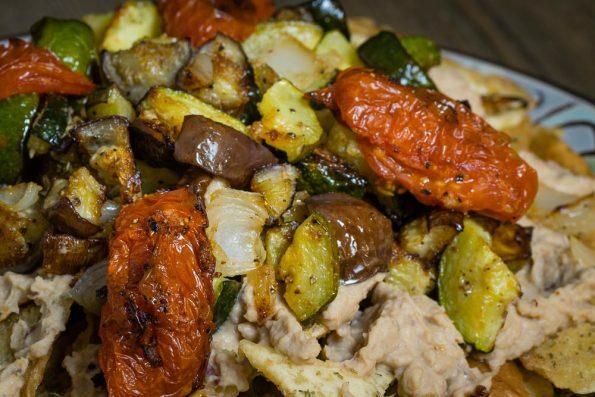 These nachos look amazing with all those roasted veggies atop. Great idea! 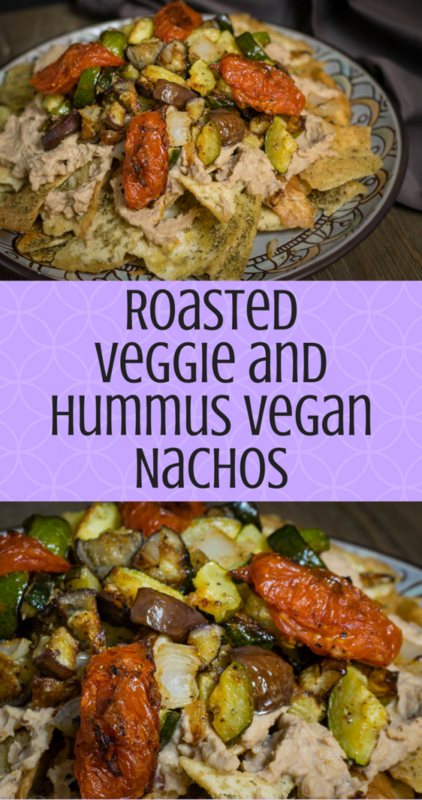 I like the approach of subbing out hummus in place of cheese – the roasted veggies look great, too!